The Board of Supervisors of Elections for Chestertown, Maryland, by authority of the Charter for Chestertown, Maryland, gives notice that an election will be held on Tuesday, November 7, 2017 for the purpose of electing a Mayor and Councilmembers in the First and Third Wards. All Town of Chestertown registered voters will be eligible to vote for Mayor. All registered voters in the First Ward will be eligible to vote for the Councilmember candidates in the First Ward. All registered voters in the Third Ward will be eligible to vote for the Councilmember candidates in the Third Ward. Forms and information regarding absentee ballots may be obtained by contacting the Town Office, 118 N. Cross Street at 410-778-0500. 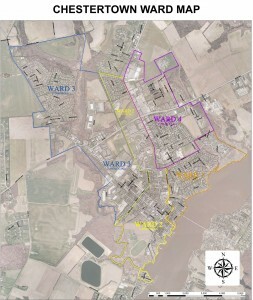 Information concerning Ward boundaries can be found online at www.townofchestertown.com or by calling the Town Office. Absentee ballots must be requested in writing no later than 5:00 p.m. Wednesday, November 1, 2017 (Note: following the November 1st deadline, there is a process for emergency absentee ballots. For information contact Town Hall). The polling place will be at the Chestertown Volunteer Fire Department, 211 Maple Avenue. Polls will be open from 7:00 a.m. to 8:00 p.m.
All residents of the Town who intend to vote in the Town election of Tuesday, November 7, 2017 must be registered with the Kent County Board of Election Supervisors on or before Friday, October 6, 2017. Town of Chestertown residents currently registered with the County are automatically registered to vote in Town elections. The Kent County Board of Election Supervisors is located at 135 Dixon Drive and is open 8:30 a.m. to 4:30 p.m., Monday to Friday, except holidays. Forms and information regarding mail-in registration may be obtained from the Kent County Board of Election Supervisors, 410-778-0038. Click here to see town election results. 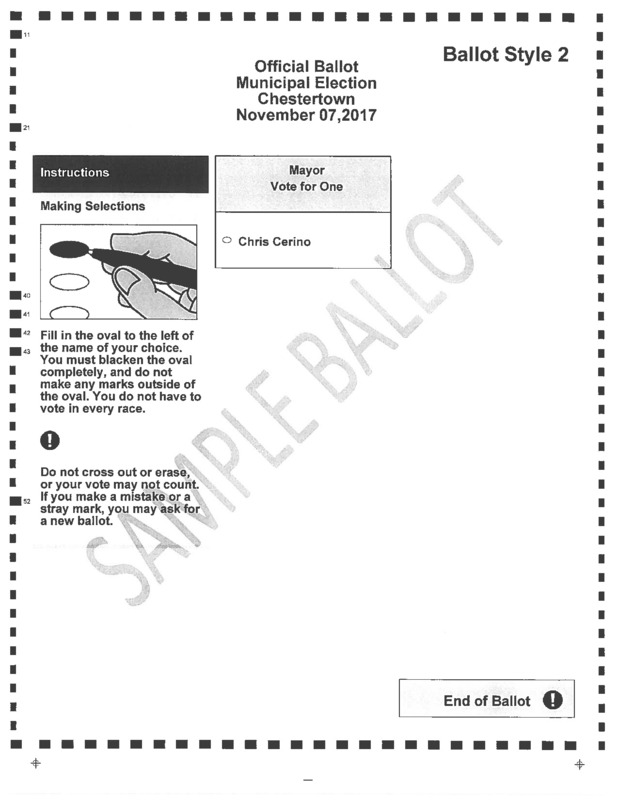 Click here to visit the Registration, Nominations, and Elections sections of the Town Charter. The mission of the Maryland State Board of Elections is to provide all eligible citizens of the State convenient access to voter registration; to provide all registered voters accessible locations in which they may exercise their right to vote, to ensure uniformity of election practices; to promote fair and equitable elections; and to maintain registration records, campaign fund reports, and other election-related data accurately and in a form that is accessible to the public. Visit the Maryland State Board of Elections website by clicking here. Visit the Kent County Board of Elections website by clicking here. Click on the image above to view the Chestertown Ward Map.